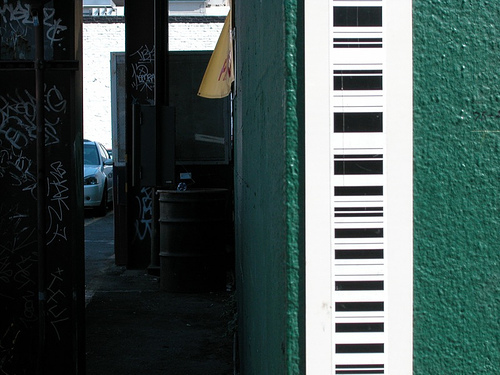 I’ve always like the simplicity and functionality of bar codes. In art school, I made a series of oversized bar code prints as rough posters and had a collection of various bar codes pulled from packaging and collected in one sketchbook. So whenever I walk by this green building on Harrison during my walk to 4th street, I notice that it has two oversized bar code-ish signs attached to two of the walls.